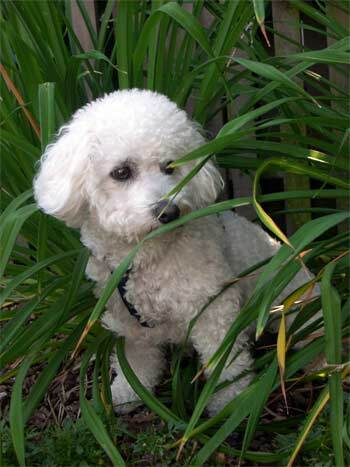 I will always have special memories of when I first met Bailey, our Bichon, on a sunny afternoon in June 2004. At eight weeks, he and his brother, both little balls of fluffy white, were romping around the sun room of the breeder�s home, located out on the sage brush prairie of southwestern Wyoming. I had just detoured south from the Grand Tetons, a summer trip from our San Francisco Bay area home that I�d been planning for several months. The detour was for the specific purpose of picking up Bailey from the family who breeds Bichons. The RV and I had just found the family�s rural acreage after a couple of wrong turns. Let�s go back a few months prior to my first meeting with Bailey. A future "Bailey" had to be male, smart, and less than a year old. He also had to be hypo-allergenic, for other family members. I had been put in touch with the family earlier in the year. I�d done my "new pet" homework and had made arrangements to pick up Bailey. Two hours after first meeting the family � and watching Ann, a nurse, give Bailey a bath and vaccination shots - Bailey and I climbed into the RV. I put him in the small, portable carrier along with a Toys R Us "Bailey" stuffed animal to keep him company. Off we drove. Bailey cried for the first half hour. I stopped and cuddled him. Drove some more. Stopped and cuddled. Ann�s husband suggested that I stay in the parking lot of the Flying J Truck Stop some 50 miles north. He said that he knew the manager and it was safe. So, I was doing another first � sleeping overnight in a truck stop parking lot. Just to be on the safe side, I parked under a big light, did not remove my clothes (to be "doggie" ready) and went to sleep. The cuddly, fluff ball and I spent the next 10 days bonding while driving to Sun Valley, over Tioga Pass to Yosemite, and back to the Bay area. He�s been a great traveler ever since and loves to look over my shoulder (harnessed, of course) as we drive the highways of our great West. Bailey is a fine example of his breed and draws comments wherever we go. I could certainly do without the visits to the pet parlor (bath and hair) several times each year. But, I have learned to wash and groom him between visits. Bailey always draws friends wherever we go. He is an ideal companion for RVing.